From the World Cup to the Olympics, from Mia Hamm to Carli Lloyd to Alex Morgan, here is the ultimate guide to Women's Soccer for young sports fans from an award-winning sports journalist. The moment the U.S. Women's Soccer team won the World Cup in 1999, the team's--and the sport's--popularity exploded in America. The Americans' electrifying rise to the top marked the biggest women's sporting event in our nation's history. Players like Mia Hamm and Brandi Chastain instantly became international stars, setting the stage for the arrival of future greats like Carli Lloyd, Abby Wambach, and Alex Morgan. And with women's professional leagues continuing to take shape in America, as well as the skyrocketing popularity of the U.S. Women's National Team, there's no doubt that women's soccer has captivated fans across the country and beyond. Featuring Top Ten Lists and stunning photos of history-making moments, this comprehensive collection catalogs the rise of women's soccer in America; the greatest American players such as Mia Hamm, Hope Solo, and Alex Morgan; the greatest international stars, including Marta and Homare Sawa; the future class of superstars; and the most thrilling World Cup and Olympic matches. This is the perfect book for young sports fans eager to kick off their soccer schooling. What’s the most popular sports team in the United States? How you answer that question might depend on where you live. Or maybe where your parents grew up. If you were born and bred in Texas, you might love the Dallas Cowboys; if you live in New England, you probably love the Boston Red Sox. Or it could be the San Antonio Spurs or the Chicago Blackhawks or another great franchise. Maybe that’s because you live in those cities or because those teams win a lot. It’s also possible your parents grew up root­ing for them and handed down their allegiance to you like a family heirloom. Perhaps you like their uniforms. Or your brother hates them and you want to be different. But those teams aren’t America’s favorite team. Those aren’t teams that get the entire country excited and emotionally invested. They don’t make everyone in all fifty states pull together and cheer. The U.S. women’s national soccer team! This team has been astoundingly—historically— popular for many, many years. The team’s ability to draw crowds and ratings and become household names has persisted through changes in the lineup and in the coaching staff. Through different World Cup and Olympic cycles. From one century to the next. This team keeps breaking records for attendance and for television viewership—not just for women’s sports but for soccer, in general. And it is likely to keep doing so. During history there have been other very popu­lar American sports teams. For example, the 1980 men’s hockey team became legendary for its “Miracle on Ice” gold medal run at the Winter Olympics in Lake Placid, when it beat the powerful Soviet Union. The 1992 Dream Team—the nickname for the men’s Olympic basketball team that played in the Barcelona Olympics—had some of the most famous players to ever play basketball on its roster. Those were teams that all of America cheered for. But they were mostly popular because of singular events. They didn’t sustain that popularity year after year after year. That’s a hard thing to do, because faces change, fans get distracted, national teams play only in certain events and not every week. Interest goes up and down. The men’s basketball players were best known for their NBA affiliations. They were already famous when they put on the USA uniforms. They didn’t have to work to make fans. But the women’s soccer team has always known how important it is to connect with their young fans. To bring their sport to different parts of the country. They have always been a team that everyone could cheer for, no matter what part of the country they live in. The U.S. women’s soccer team players are best known, first and foremost, for representing the United States. They are a team that unites America. And can make us proud. A long time ago, people would have been shocked that a women’s sports team could fill the role of America’s favorite team. Women’s sports weren’t con­sidered very interesting or taken very seriously. But the U.S. women’s soccer team helped change those ideas forever. The team first came into existence in 1985, but nobody really paid much attention to it back then despite the fact that soccer is the most popular sport in the world. Soccer was far behind other sports in the United States. And women’s team sports were just starting out as an entity to be taken seriously. It took several years and a lot of hard work by the players to get noticed and build an impressive wom­en’s national soccer tradition in the United States. In 1996, when the women’s team won a gold medal at the Atlanta Olympics, it was the first time that women’s soccer got any national attention. Onlookers were totally surprised by how many fans packed the stands to watch the team earn the gold medal, with a victory over China. Not only was the U.S. women’s team’s rise to the top of the sport amazing, but so was the way fans embraced it. It was an example of “grassroots” popu­larity, because it started from the bottom and grew upward. Fans found the team and its popularity grew and grew, until finally media outlets and corporate advertisers had to take it seriously. A lot of the sports experts didn’t see it coming. With momentum building, in 1999, the team’s popularity exploded. The U.S. women won a World Cup in the United States by defeating China and capti­vated the country, selling out giant NFL stadiums and attracting huge TV ratings. It was the biggest women’s sporting event in our nation’s history. The individual players like Mia Hamm and Brandi Chastain became as famous as many male athletes, which had never happened for female athletes who play team sports. Though the players on the roster have changed in the past two decades, the team’s popularity hasn’t. In fact, it only continues to expand. In the 2015 Women’s World Cup, the final game drew twenty-three million viewers, making it the most watched soccer match—including games played by men—in American history. Why is the American women’s soccer team so popular? It’s an especially interesting question because our country doesn’t have as long or as rich a soccer his­tory as many other countries. First, the team has been incredibly successful. Thanks to laws in our country that we will talk more about later, young American women have had many opportunities to play sports. Our soccer team has taken advantage of all of those chances. The players have been very, very talented, winning three World Cup championships, four Olympic gold medals, and one silver medal. The U.S. women’s team has been able to sustain success, starting from its early beginnings until today. In fact, the team is historically so good that every­one was shocked during the 2016 Olympics in Rio de Janeiro when it was knocked out in the quarterfinals against Sweden. It was the first time the American women had failed to advance to at least the semifinals of a major tournament. Another reason the team is so popular is that it represents something that we all value in America: the fight for equality. The women who play the game have broken down barriers and have fought hard to be treated equally as athletes. They have helped to change ideas about what it means to be a strong, suc­cessful woman. They make us feel proud and remind us of what it means to strive for greatness. Over the years, members of the team have made great efforts to connect with their audience and be accessible, and they continue to work to boost the sport’s following by interacting with fans and starting soccer clinics for young, aspiring athletes. They have helped build women’s soccer into a national phenom­enon, paving the way for future generations of young girls to continue the tradition. Here’s another reason the women’s team is so pop­ular: Soccer is a sport that is very similar no matter who is playing it, men or women. In other sports, like basketball, women’s teams are often compared to the men’s and sometimes that comparison works against them because they’re not as tall, they don’t dunk as much, and so on. Almost all of the female athletes who play baseball get encouraged to eventually switch to softball, a very different sport. And few women play football at any level. But soccer has the same rules. A match looks the same no matter the gender of the teams playing on the pitch. This is a book about what makes women’s soccer so special. About the most important players—not neces­sarily the best but the ones with the biggest impact—in the world, both Americans and those from other coun­tries. You might have a different list, but that’s one of the fun parts about sports: picking our own favorites and deciding what we value most in an athlete. In this book, you’ll also read about the history of the game and the big events that have shaped it. Included in the stories of the players and important games is also the story of how far women’s sports has come over the years. And you’ll even learn about the next generation that will carry the sport forward. 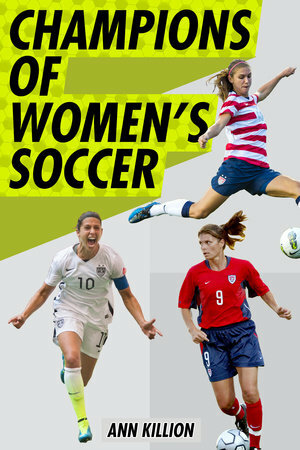 These are the champions of women’s soccer who have changed the world of sports.